﻿ The D Las Vegas, Las Vegas (NV) | FROM $26 - SAVE ON AGODA! "Everything was really nice and clean." Have a question for The D Las Vegas? "Spotless clean, friendly staff, easy to navigate hotel." "The rooms were nice and clean, with good views from both sides." "they had a great price, free WiFi and was clean." Conveniently located in Las Vegas, The D Las Vegas is a great base from which to explore this vibrant city. From here, guests can enjoy easy access to all that the lively city has to offer. 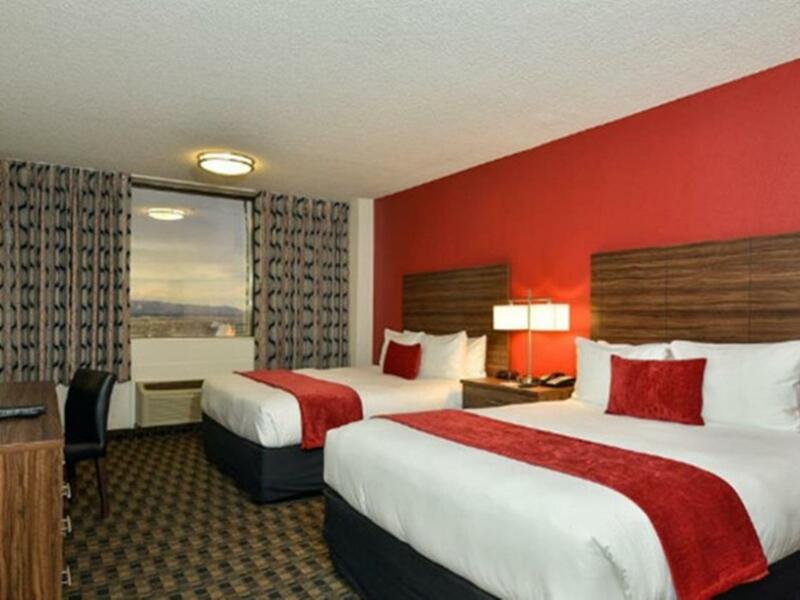 A haven of rest and relaxation, the hotel will offer total renewal just steps away from the city's numerous attractions such as Fremont Street Experience and Neon Museum. A selection of top-class facilities, such as meeting facilities, room service, a business center, shops, and laundry service/dry cleaning can be enjoyed. An in-room safe, hair dryer, seating area, and air conditioning are just some of the facilities at your disposal. The hotel's outdoor pool, hot tub, and nearby golf course are ideal places to relax and unwind after a busy day. 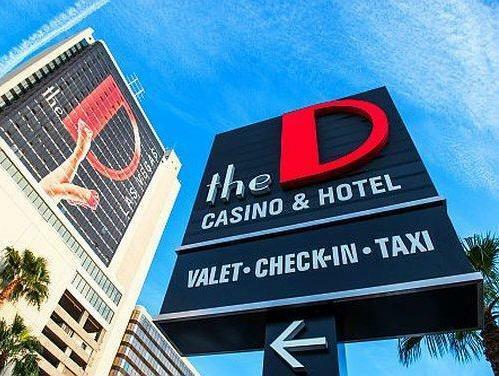 Whatever your purpose of visit, The D Las Vegas is an excellent choice for your stay in Las Vegas. "I love it here because it close to everything and all the ma..."
We checked into the tower that was right above the 3rd St Stage. Although we were on the 14th floor, the noisy coming in from the band was very loud. There is no double glazing on these windows which would certainly help with the noise issue. Other than that the room was perfect for the price. We requested a room change immediately and was told they couldn't move us as they had NO rooms left and we should try in the morning. Again no luck as they said they were full. I did a check on their official website and found that I could get a room. I told them what I had found and they went to the computer at the far end and then said that they did find one room available away from the other tower. This is the first time I stay in Fremont street in Las Vegas. I love it here because it close to everything and all the major hotel in downtown are next to each other. The hotel is clean and car park is easy to access. Check in is easy and fast. The front desk lady is very helpful, I have made two reservations through Agoda for three consecutive nights, the front desk lady managed to check me in in one time without having the hassle to request me to redo the check in again for my second reservation. Close to Fremont . Free valet parking if guest. Good food selections. Cons: not eneough non smoking rooms. Weed smell in hallways. Good and bad is that it is all over Nevada and California now. Have fun! Really great time. Fist time staying at The D and it was great. We always come to Vegas for SuperBowl weekend and we will be staying here from now on. We love the elevators too another fun thing to put a wager on... You gotta stay there to understand. They charged me $15 a night “upgrade” fee for a king bed instead of 2 queens so my husband and I could sleep together. The room and bathroom was tiny. There was no refrigerator, no microwave and no coffee pot. I was told I could check in at 12pm then when I got there they said check in was at 3pm my room was finally ready at 3:45pm. Staff at the desk was rude when checking in. I will never stay here again. We were impressed and have nothing but great things to say about The D Las Vegas. It was our first time and we are excited for our next Vegas trip. We had so much fun and the hotel was clean, staff were great, food was amazing and the night life was live. Can’t wait to return. The room was marked cheap and RFi. Which read resort fee exclusive but exclusive is spelled with E not i. My first complaint is they wouldn't let me check in early, when i came back at time suggest they Still didn't have room ready and Suggested i Pay more to upgrade to get a room that was ready. BS i refused & waited for My room I paid for. After I came back Again later they told me I HAD to pay Resort Fee of $200. I questioned them regarding the Reservation through Agoda, the advertised amount and her explanation. I was unhappy with the Explanation and Agodas advertising an improper amount and Title of the room. After Finally getting to my room Everyday i noticed the smell of Marajuana in the hallway, room would not be cleaned until After 3pm so I bypassed it a few days no need to. The experience I had was not good. You can try it at your own expense BUT I would never recommend this hotel. One of the nicest place on Fremont. The staff was excellent and made my stay memorable. When I get to Vegas, I will be staying there again. The Fremont experience was better than being on the new side of Vegas. The food was good and not expensive, overall I partied. The only thing I recommend is bring your own bottle to enjoy yourself. We wanted to stay on Fremont. The D provided a nice, updated hotel at a good price. The owner was onsite several times during our stay, which says a lot about how successful he wants the hotel to be. The noise level from the street is loud from about 10am til 2-3am (we were on the 12th floor). However, if you are Vegas then quiteness isn't what your looking for anyways. The noise from the street did not bother us. We will be staying here again. The Sigma Derby machine in the casino is great. I didn’t expect to be charged a resort fee, but was. Room was clean. Hotel appears to have been renovated in the last 10 years. Saw a show in the showroom and it was quite entertaining. I’d stay again overall, but there’s not a ton about the experience that’s exceptional. We love staying at the D. Always lots going on downtown and we don’t have to get out in the car. we wanted to be slightly away from the strips and this place suit the purpose. food and store nearby to get those little things when in need. abit noisy when out of the room but this is vegas and what else do you expect. Carpark is almost full during the weekend. other than parking, all are fine. Upon arrival, after already paying for the room the staff member told us there would be a $100 deposit that shows NOWHERE on their website ANYWHERE. I told them we didn’t have a card on us but could give them the $100 in cash but then was told if it’s cash that it’s $200. We left and we’re unable to stay in the room that I already paid for. The hotel itself is great. Clean, modern, big comfy bed, nice shower and bathroom. Even an extra bed in the couch in the room. However, it's RIGHT on Fremont Street. RIGHT next to a stage playing live music all night until 2am. You will not sleep before 2am. Even with double-pane windows and earplugs I could hear the band rocking all night long. I finally just gave in and went out and drank and gambled until the street shut down. I mean it's Vegas, baby. The restaurants were decent, the coffee guy RIGHT by the elevators was a brilliant touch. There isn't much of a "resort" - the pool isn't heated in off-season and there is no jacuzzi - yet there is a resort fee putting the room at about $50 a night all in. A good deal overall.